The Peach Drift® Rose is a wonderful new variety of small rose that needs none of the special care usually needed for roses. It grows into a mounding bush, 18 inches tall and about 2 feet across, so it is the perfect size for any garden. A single plant looks wonderful in a small space, and a group used as an edging on a bed, or a drift among other plants, will be a constant joy. The flowers are small, but perfect. They have many petals, and open into a cup of pink petals with a peach heart. The color combination is stunning, and the flowers just keep on coming and coming on this wonderful rose. It will be in continuous bloom from spring to fall with very little work from you. It is also small enough to be perfect in planters, boxes and pots, so you can grow it on a terrace or balcony with ease. 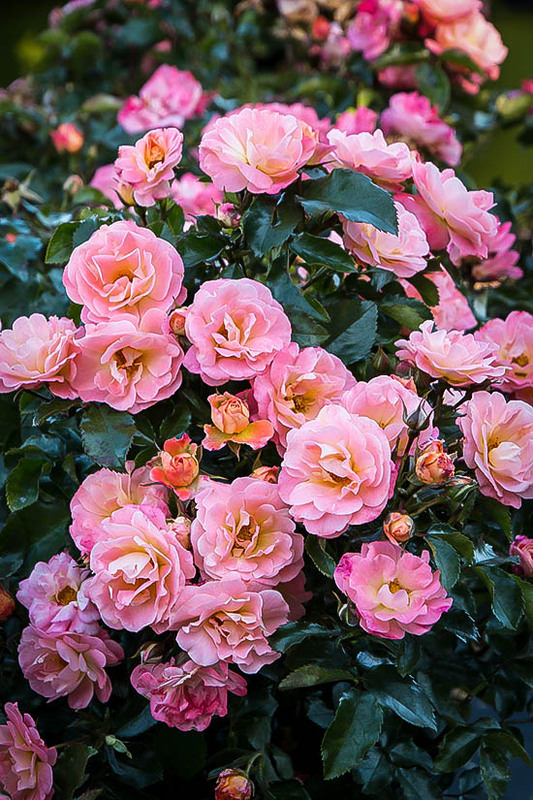 The Peach Drift Rose should be planted in a sunny spot to keep it blooming constantly. It will grow in all kinds of soil, including clay soils, but it should not be grown in very dry, sandy soil, or in soil that is always wet. 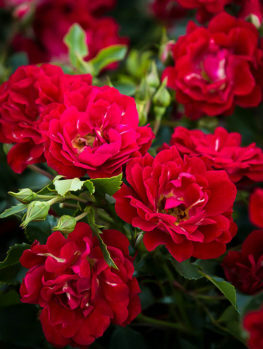 It has been bred to be very resistant to all the disease that usually bother roses, so it will always be healthy, with lush, rich green, glossy foliage. You will never need to spray for diseases, and it needs no special care, besides regular fertilizer, to keep it healthy and constantly in bloom. 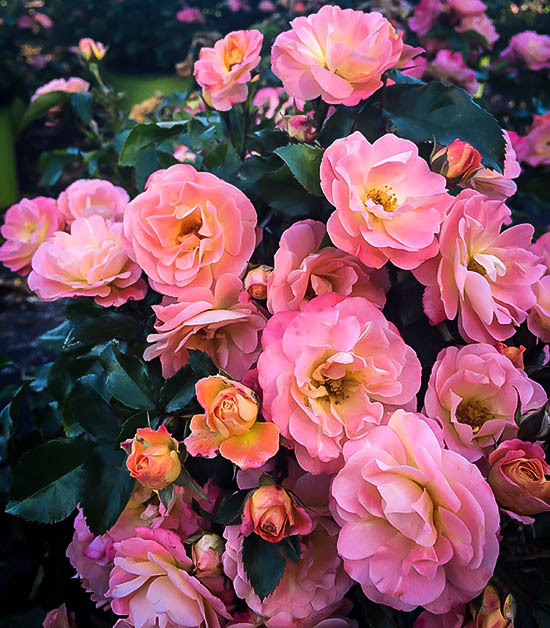 The Peach Drift Rose is a new and exciting type of rose that changes the way we think about, and use, roses in our gardens. This plant should be used as a charming and interesting flowering shrub, and it is remarkable for its resistance to disease and for how easy it is to grow. No more struggling with complicated instructions and special pruning. No more spraying for outbreaks of disease. 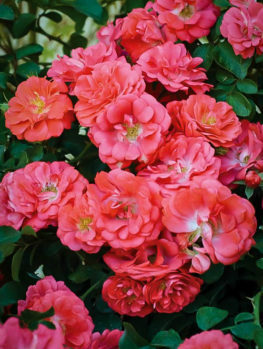 This rose is a joy to grow, because it is so easy, yet so attractive in the garden it will soon be your favorite shrub. The Peach Drift Rose grows into a low shrub, just 18 inches tall and 24 inches across. It fits perfectly into the smallest garden, and it can also be planted in groups of any size, to fill larger spaces with bloom. It is even small enough to grow well for years in planter boxes and larger pots, blooming as constantly as any annual flower. The small leaves are glossy and rich green. 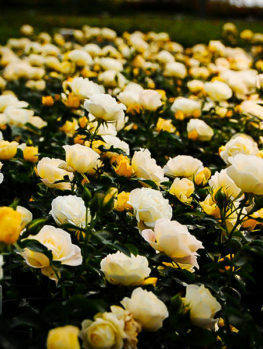 They are never damage or made ugly by diseases, because this plant has been specially bred to resist the common rose diseases. Black Spot, Mildew, Rust – there are all things of the past once you grow Drift Roses. The flowers of the Peach Drift Rose are small, but they come in the hundreds. From early summer, right into fall, there will be a constant succession of blooms, carried in open clusters, each one having dozens of flowers in it. The flowers have many petals and each flower looks like a miniature rose, with 15 to 20 petals. When the flowers are in bud, and as they begin to open, they are a beautiful soft pink color. As the petals spread and the flowers open fully, a peach blush fills the heart of the flower, making for a stunning display of colors. The flowers are so profuse you can hardly see the foliage beneath them. As one wave of blooms fades, it is replaced by new ones, in a succession of peach and pink tones. The Peach Drift Rose is the perfect plant for the front of beds, because it stays low and does not hide what is planted behind it. It will look beautiful mixed with flowering plants like catnip, blue salvia, or bell-flowers. It looks wonderful mixed with blues and purples, and it can also be mixed with whites, peaches or apricot-orange tones. In a small garden just one is perfect, but in larger beds you will love the effect of planting them in a drift along the front, or in groups among other low-growing plants like dwarf blue evergreens, or Spirea. 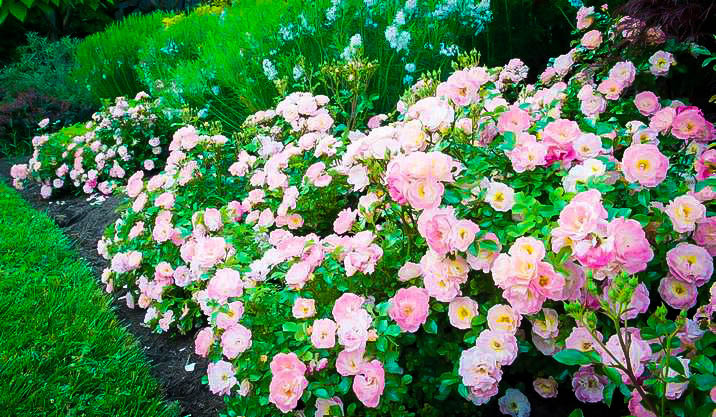 Make sure you plant the Peach Drift Rose in a sunny location, in any kind of soil that is not always dry, or always wet. Roses grow well in heavier clay soils, and this one is no exception to that. 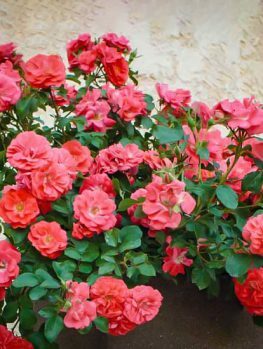 Prepare the soil with plenty of rich organic material dug in, and use a rose fertilizer regularly to keep those flowers coming. 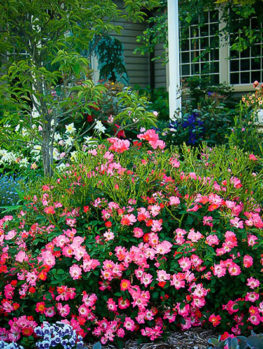 In spring, before the new growth begins, remove some of the smaller branches, and trim off old flower heads. Your plants will grow rapidly in spring and soon be in bloom. The Peach Drift Rose is one of the best of a new group of roses, called Drift Roses. These were developed in France by the famous rose-growing family Meilland. They are a new type of rose, bred to stay low and broad, but mounding, not spreading widely. 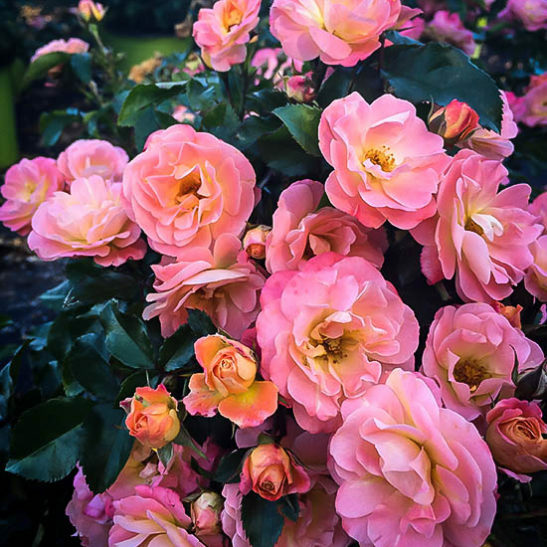 The breeding was complex, but used the ‘Paul Crampel’ rose, a low-growing rose with orange blooms, developed in the 1930s, and ’Lady Gay’, a vigorous spreading pink rose from 1905. As well, a modern, pink-to-white rose called ‘Grouse’ were involved, along with ‘Red Minimo’, a tiny rose growing only 6-10 inches tall. 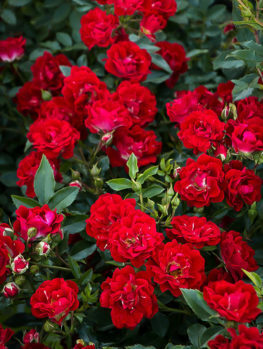 The breeding program payed a lot of attention to making a rose that was very disease-resistant, and would not need spraying. They also wanted roses that kept blooming and blooming, without a lot of special care – and they succeeded. Your bushes will always be full of beautiful blooms. The Drift Roses are very new, but very desirable, and the Peach Drift Rose is certainly one of the most exciting in the range. So although we have good supplies, we know that demand will be huge, so our stocks will not last long. 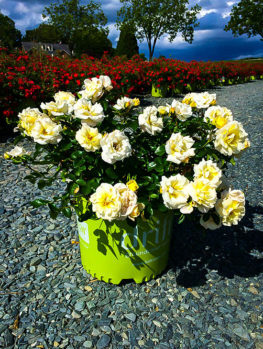 Be among the first to grow this remarkable rose, but order now or you could easily be disappointed. 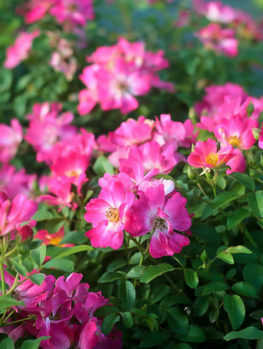 You may also want to consider other plants from this series, such as the Pink Drift Rose and the Red Drift Rose.